A square matrix can represent any linear vector translation. Sometimes we want to constrain the elements of the matrix so that it represents a pure solid body rotation. A matrix representation of a rotation therefore contains redundant information, a 3D rotation has 3 degrees of freedom but a 3×3 matrix has 9 scalar values. Provided we restrict the operations that we can do on the matrix then it will remain orthogonolised, for example, if we multiply an orthogonal matrix by orthogonal matrix the result we be another orthogonal matrix (provided there are no rounding errors). By making the matrix from a set of mutually perpendicular basis vectors. The determinant and eigenvalues are all +1. The matrix represents a pure rotation. 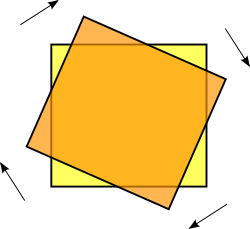 When we are representing the orientation of a solid object then we want a matrix that represents a pure rotation, but not scaling, shear or reflections. To do this we need a subset of all possible matrices known as an orthogonal matrix. For information about how to reorthogonalise a matrix see this page. Orthogonal matrix multiplication can be used to represent rotation, there is an equivalence with quaternion multiplication as described here. This can be generalized and extended to 'n' dimensions as described in group theory. One way to think about a 3x3 orthogonal matrix is, instead of a 3x3 array of scalars, as 3 vectors. Any point in space can be represented by a linear combination of these vectors. Another restriction on the values of the basis vectors is that they are of unit length. This matrix has n×n scalar numbers, where n = number of dimensions, in this case 3. But they are not all independent, so although the matrix contains 9 numbers there are less than 9 degrees of freedom. So if we start with 9 degrees of freedom and then apply the three dot product equations we get 6 degrees of freedom, then we apply the three unit length equations we get 3 degrees of freedom. (We can't also apply the three cross product equations because this is not independent of the other restrictions already applied). So an orthogonal matrix in 3 dimensions has 3 degrees of freedom as we would expect for a construct which can represent rotations in 3 dimensional space. There may not be more than 3 dimensions of space in the physical world? but it can still be useful to look at orthogonal matrices in a way that is independent of the number of dimensions. So how many degrees of freedom does an n×n orthogonal matrix have? We need to know how many independent constraints there are, we can't use both B1•B2=0 and B2•B1=0 because we can derive one from the other. Which is an arithmetic progression as described on this page. Which is the second entry in pascals triangle, or the number of combinations of 2 elements out of n.
This is related to bivectors in Geometric Algebra. For a vector of dimension 'n' then the corresponding bivector will have dimension of n!/(n-2)! 2! When we think about the matrix in this way we can see how a matrix can be used to represent a rotation and to translate to a rotated frame of reference. For more information about how to use a matrix to represent rotations see here. Reorthogonalising a matrix is very important where we doing a lot of calculations and errors can build up, for example where we are recalculating at every frame in an animation as described here. At least this seems to give appropriate results in the examples here. There are some things about this derivation that make me uneasy, for instance constraining [C] to be symmetric seems to come out of nowhere. This is discussed further on this page. The orthogonal matrix preserves the angle between vectors, for instance if two vectors are parallel, then they are both transformed by the same orthogonal matrix the resulting vectors will still be parallel. The magnitude of eigenvalues of an orthogonal matrix is always 1. As a check the determinant is the product of the eigenvalues, since these are all magnitude 1 this checks out. eigenvalues of an orthogonal matrix is always 1. Although I'm not sure these properties alone would be enough to guarantee an orthogonal matrix. We could check that the matrix always preserves the length of a vector or the inner product but I don't know a easy and repeatable way to do this for all matricies? Do these two components have a physical interpretation? There are (al least) two algebras associated with transformations in a vector space: the algebra that allows us to combine transformations (such as multiplication of square matrices or quaternions) and the algebra that calculates the effect of transformations on points (multiply the matrix by a vector or quaternion sandwich product). If you want to go beyond the practical implementation, to try to understand about why this might be so, then we can use a very abstract level of mathematics called 'category theory' and in particular the concept of a monad.